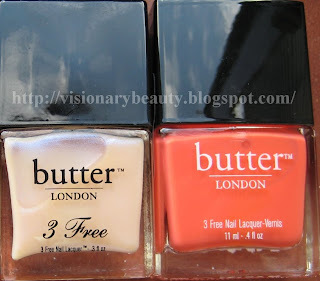 The first thing that draw me to Butter London was the formula, which omits formaldehyde, toluene and DBP. 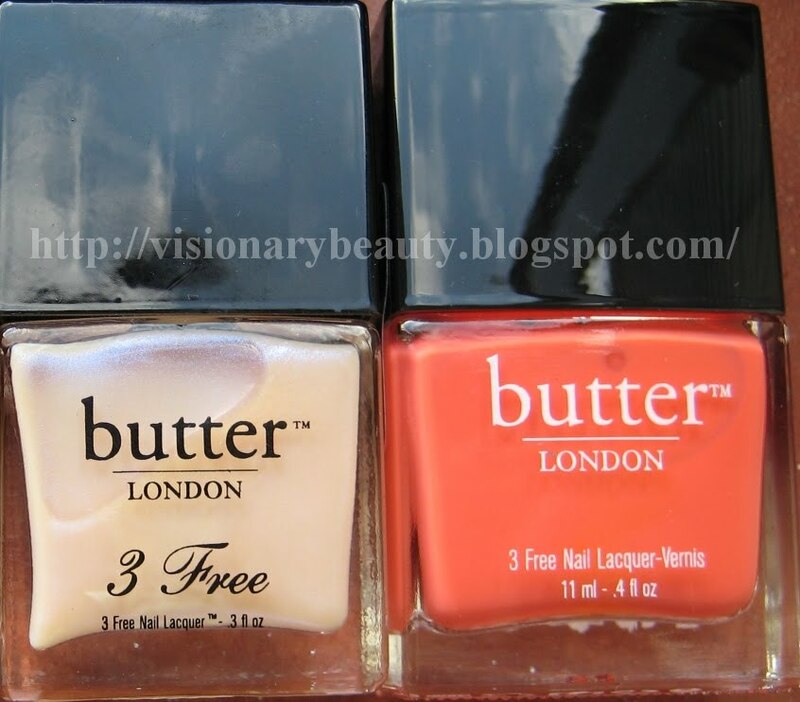 The second was their varied shade range. 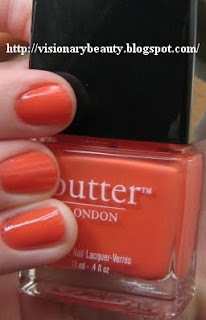 Jaffa is a screaming non shimmered orange, nice for a change, and it certainly got me comments! Hen Party is a pale opal shade with a slight blue sheen. Pretty used alone or over another colour. Now I know I have not applied these neatly but I was speed painting! I do find that you can get a bit of chipping after the second day so probably best worn with a top coat but the colours apply well and have no fade. I’d like to get Yummy Mummy next as that is a beige shade everyone seems to rave about; I’d also like to get their base and topcoat. I’m just want, want, want…. I’m a bit late to the game here as this is part of the spring 2010 collection. 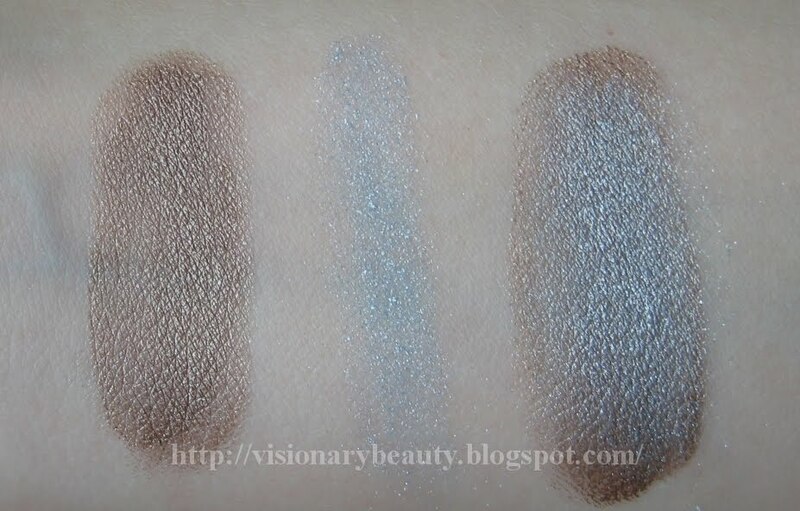 I bought the duo in Glint Blue (£29), which consists of a sparkling metallic brown/taupe liquid shadow, and a sparkling pastel blue loose powder. The liquid shadow comes packaged in a squeezable tube; you get a lot of product here especially considering you only need a tiny amount each time. The powder shadows is packaged in a tube with a sponge applicator . Swatch L-R:Liquid,powder and liquid with powder on top. The liquid shadow dries amazingly fast and goes on smooth, the colour applies very even. I got no creasing and it didn’t budge or fade all day. I do however find it feels a bit drying, not so much to be uncomfortable but you can feel its there if you get what I mean. In terms of the powder, I didn’t get fall out during the day but the colour is quite sheer so I feel it’s better used on top of the liquid rather than alone. 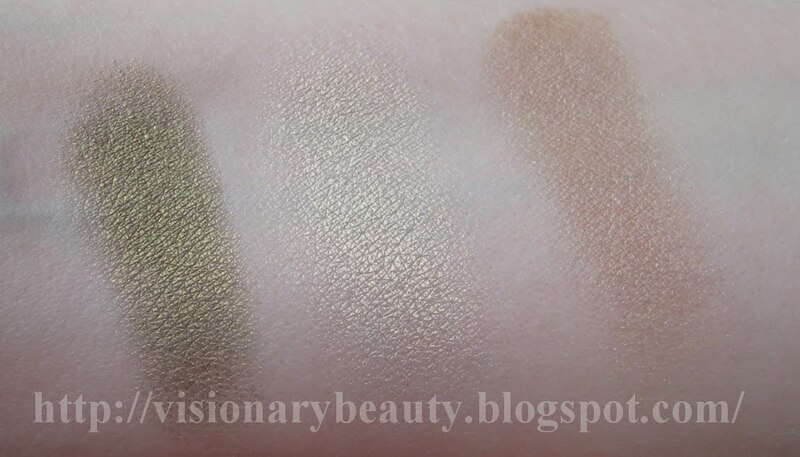 I really like the colours and, slight dryness aside, I am really impressed by the texture and wear of the liquid shadow, however I do feel that the finish is just too shiny/metallic for me. Perhaps its because I’m the wrong side of 30 but I am finding that more shimmery/frosty, metallic shades don’t quite look right on me anymore, somewhat out of place and a bit harsh, shame really as I really like this, just not on me! 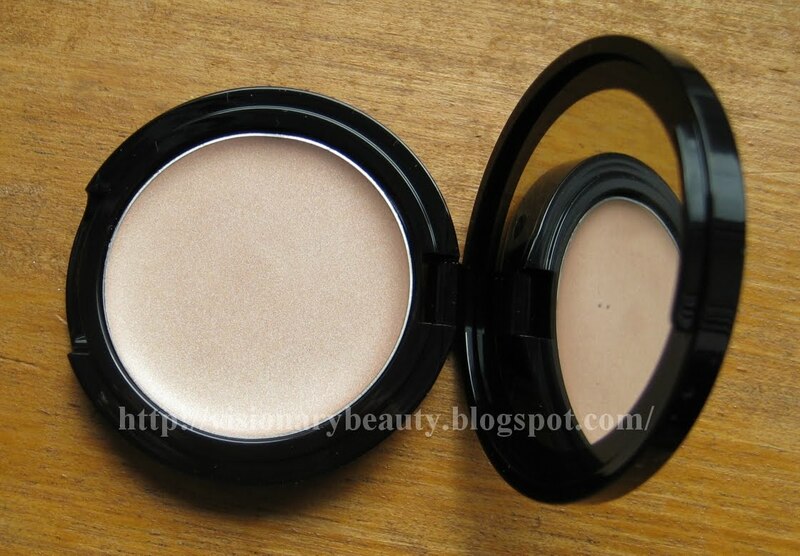 Sunlight (£29) is a light cream colour with a gentle gold shimmer in the compact. Applied it doesn’t add much colour, but there is a subtle champagne tint. What it does give me is a subtle luminous natural glow. The texture is perfect, its not greasy or sticky yet its creamy so its blends with ease and it feels really lightweight. I have been using this nearly everyday since I bought it and have had no issue with clogged pores or breakouts (I have to be careful with blush/highlight type products). 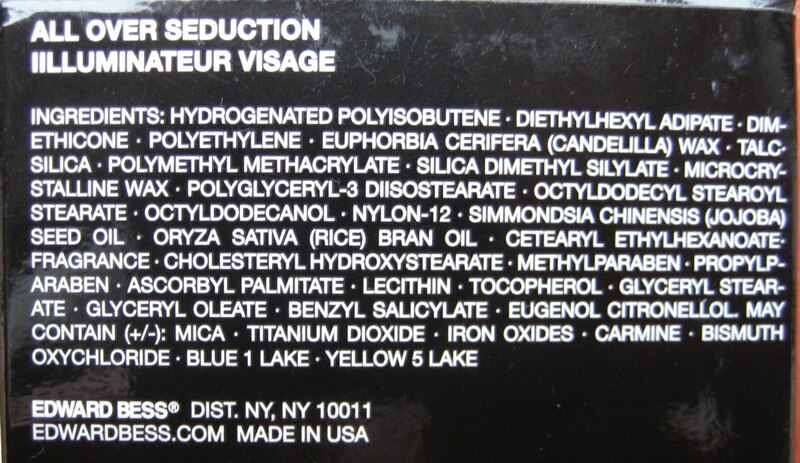 I use it on top of the cheekbones and under the eyebrow and at the side of the eye. This is so easy to use and really gives a luminous look that doesn’t look like you have loaded yourself with product but rather that you just have a natural healthy glow. 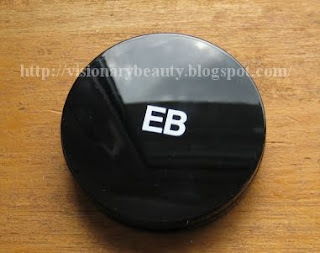 I've fared really well with EB so far, it does seem a very foolproof brand, more reviews to come. Upon opening the Secret Brightening Powder (£18) I was slightly sceptical about the white shimmer. Luckily it doesn’t seem to notice once applied. Used under the eyes, it goes on very smooth so doesn’t emphasis those pesky little lines, however for me it applies too light in colour and highlights the area which makes my circles stand out more. In terms of setting my under eye concealer this does not last on me, by mid day I can see it has worn off. I do however really like this product as an under the eyebrow brightening/highlight and on the outer corners of the eye, it gives a natural illuminating brightening effect. My final item was the tinted moisturiser (£32). As I bought this around the same time as my RBR one I just put in a drawer for a while and forgot about it. When I did finally get it out I had a sudden break out after using this, weary that this might be the cause I waited for my skin to heal and then tried again. I did find that when I used it again it did seem to exacerbate 2 cystic spots which I have had for years (they just won’t die) but didn’t break me out in any new areas, so I really would try and get a sample first if you have acne. Texture wise it doesn’t spread as well as my RBR and is less forgiving on my dry skin, Jane from http://modestybrown.blogspot.com/ describes it as “Icky” and in hot weather it does feel extremely “Icky” on the skin. I do find the coverage, albeit sheer, is buildable although I need to set it with powder to get it to last. Ultimately the best thing about it was the colour, as porcelain matched me well. So all in all my dabbling in LM has been mostly misses, I will try the eye perfector again but overall it was quite a disappointing haul. I can’t think of a better name for this trio as a soft smoky eye is exactly what you get. 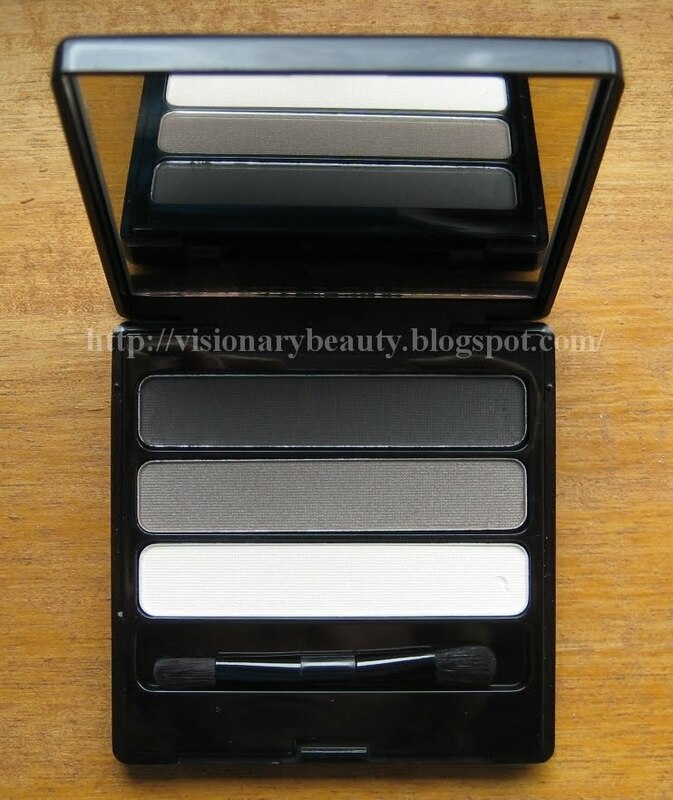 It contains a pale off white base/highlight shade, a medium grey and a deep charcoal. The white and charcoal look almost matte however there is a faint shimmer to the grey. I have read a few reviews that don’t think the quality of the trios matches that of the single shades, however whilst I would say its perhaps not as pigmented in one stroke as the two singles I have there are no negatives I can report. The colours although basic are effortless. I find a lot of sets geared towards a smoky eye are usually too harsh and the colours too conflicting, however these colours just meld into each over, allowing for a simple but effective graduation. 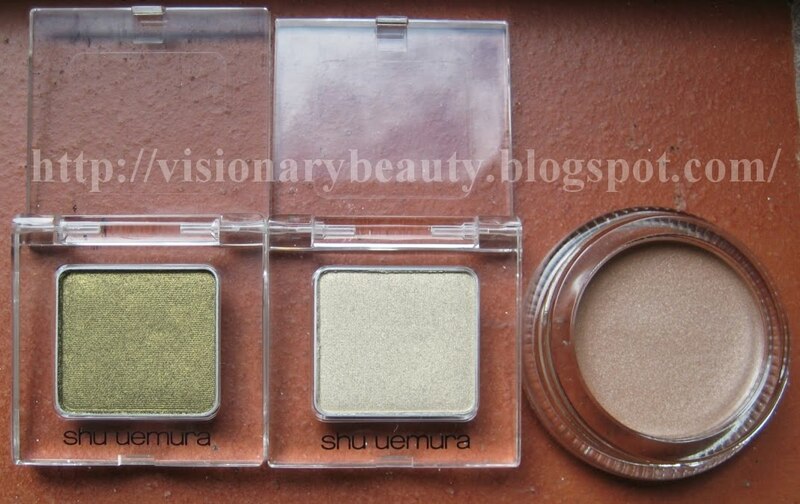 Although these are called sheer eye shadows I found them pigmented. In my swatch I have done two strokes of each colour. They come in a weighty compact with mirror and throw away sponge applicator. 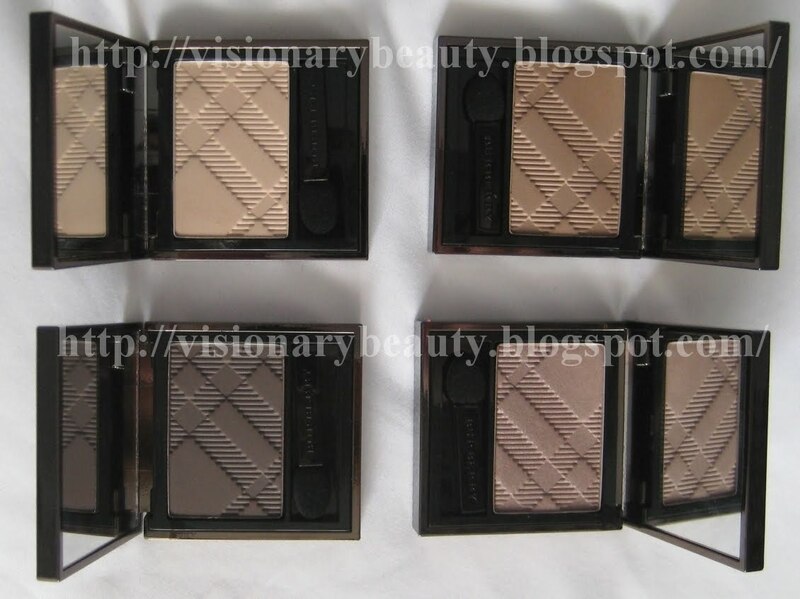 The compact has the signature Burberry check on the cover and the powder is embossed with the pattern as well. 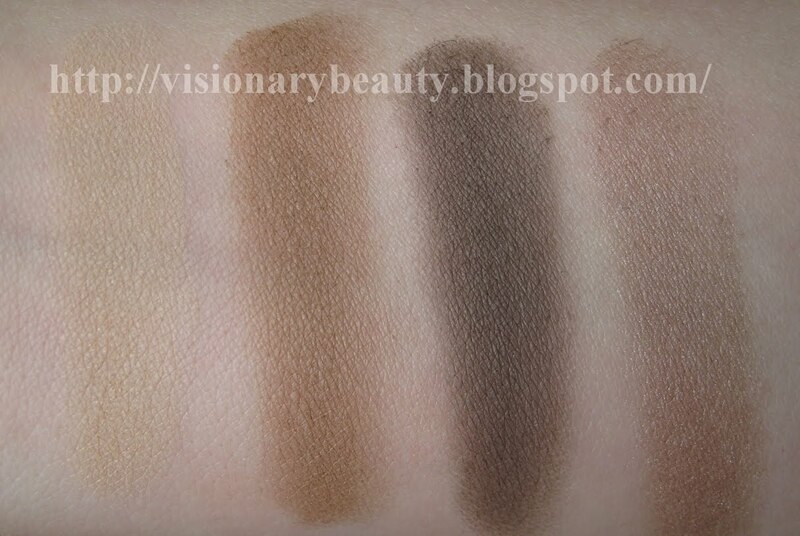 The texture of all the shadows is really smooth, and they don’t feel dry or overly powdery. 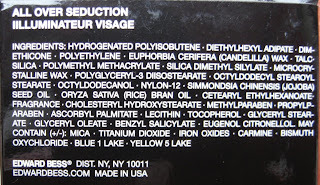 Although I personally find them pigmented they are easy to build up if desired. I feel slightly traumatised over the amount of photos I took to try and capture the exact colour of these (that's why you have two photos) but I have had to concede that my camera (and camera skills) are lacking, so you’ll have to believe me when I say they look better in real life! Swatches L-R: Trench, Almond, Taupe Brown, Rosewood. 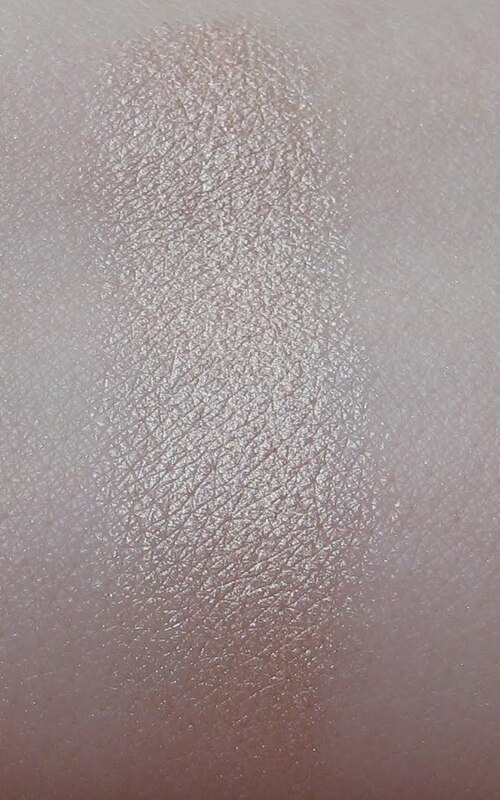 Trench #02 is a semi matte light beige, I thought I could use this as a base shadow but its slightly too deep to match my very pale skin so I use it as a lid shade. 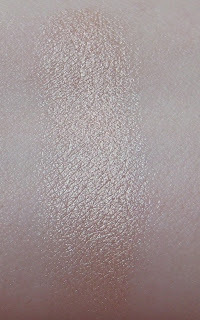 Almond #06 is a warmed light brown that has a soft glow. Taupe Brown #07 is a medium to dark matte grey taupe. Rosewood #09 is a slightly shimmery soft taupe with a bit of a mauve/rose tone. From what I have tried so far I think the packaging feels and looks like a high-end brand and the products perform as such. Whilst they do not necessarily exceed my other similar priced brands, the quality is definitely there and I will be buying more. 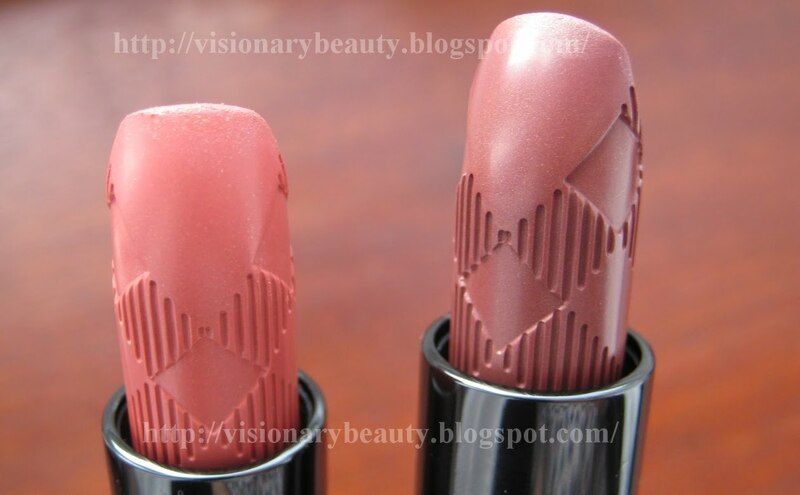 In terms of the colours, they fit with what I would expect from Burberry (classic, natural tones). Overall I do like all 6 products but am more impressed with the eye shadows than the lipsticks. 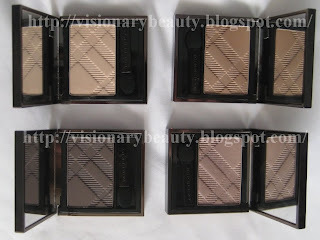 The shadows cost £22 each and I bought them from Harrods who are currently the only UK stockist for Burberry Beauty. 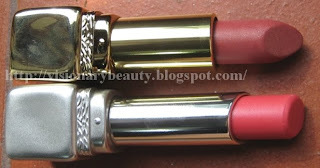 Although the packaging of Burberry lipsticks is a bit bulky and slightly heavy, they have quite a luxurious look and feel about them. 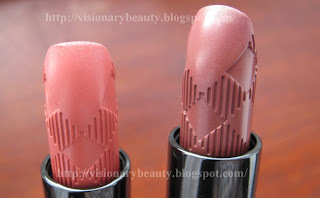 Burberry Lip cover in Cameo pink shows up on me as a peach with a touch of pink, with subtle golden micro glitter. Lip cover in Rosewood applies as a medium neutral toned, mix of rose, brown and a slight bit of mauve, hard to describe but I really like this shade and can see it being extremely popular. I would say it has a satin finish (not matte but not shimmery). 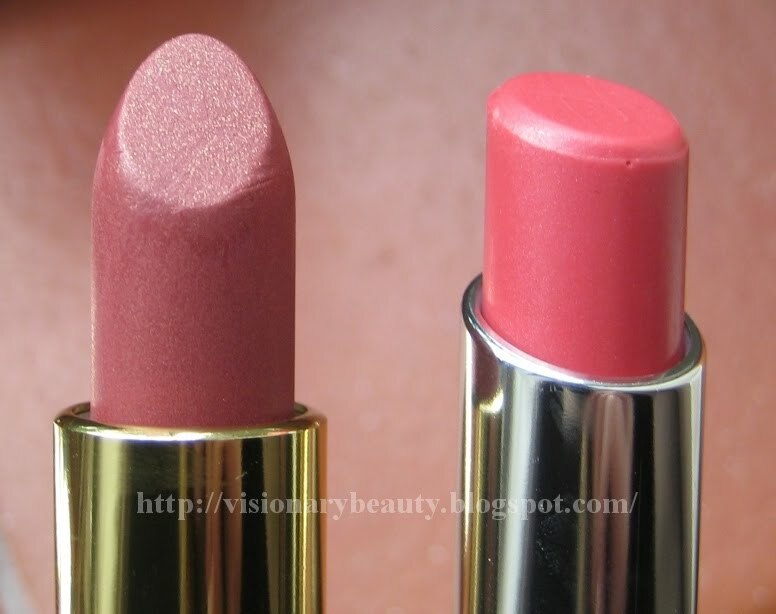 Both lipsticks have good pigmentation, apply smoothly and have average lasting power. My only downside is whilst they are not drying I don’t find them as moisturising as some of my other brands. Please note that these lipsticks are scented, its not as strong as Chanel for example but its definitely there. Overall the Lip Cover’s look like they have a great selection of neutral easy to wear shades with some more classic reds thrown in. I bought these from Harrods who stock the brand exclusively for us in the UK. They cost £22 each. 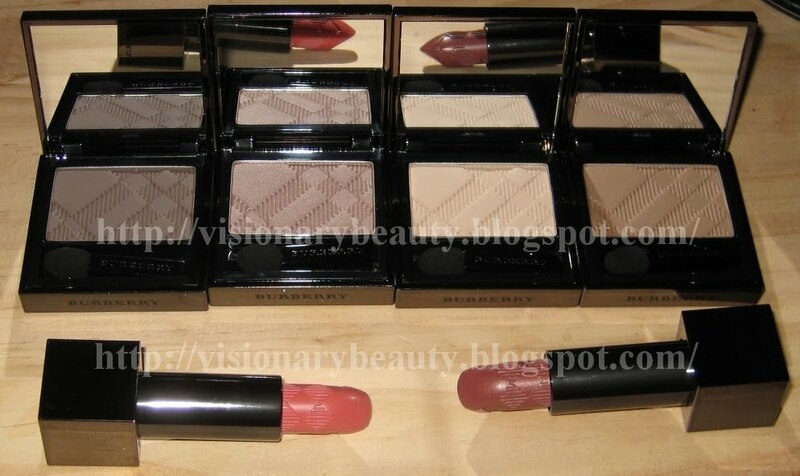 Burberry beauty arrived in the UK this Monday at Harrods. I thought I'd post you a picture of everything I got, as I know when I placed my order early this week there wasn't many real life pictures around so it was difficult choosing what shades to get, although it seems like I have gone for the same shades as everyone else so this is probably not as helpful as I had first thought! At any rate I'll be posting more pictures/swatches and reviews of the items this weekend. Edward Bess has just launched in the UK, exclusively at http://www.zuneta.com/, I think Zuneta is the perfect place for EB, they are steadily building up an impressive arsenal of exclusive, luxury, forward thinking brands. 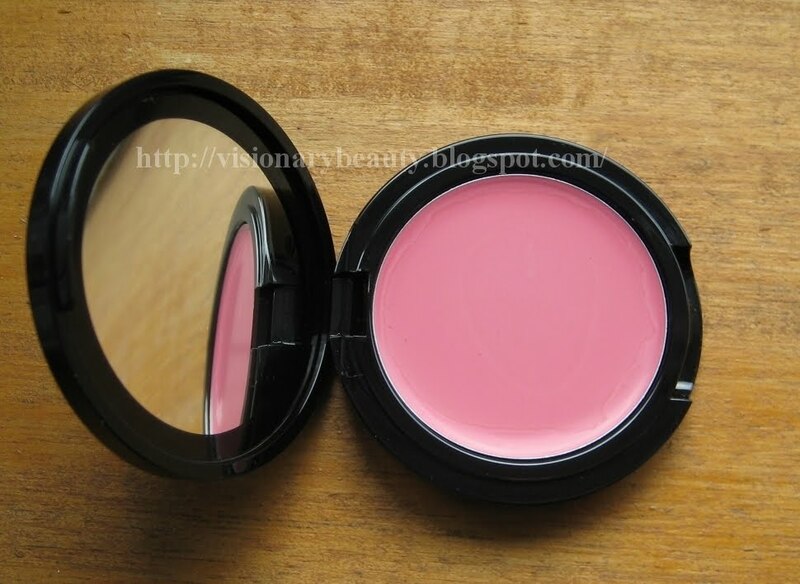 I don’t own many cream blushers as I find they can be unforgiving if you don’t have clear skin and they usually contain problematic ingredients if you are acne prone. As I had read good reviews of the compact rouge I decided to buy the cream blush (£30) in shade Love Affair; this comes in a sleek mirrored compact and looks like the newer packaging. 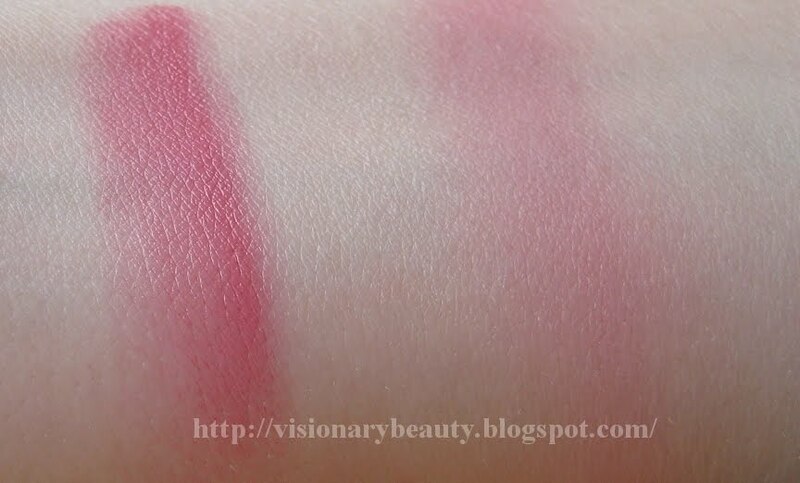 The colour is described as a watermelon pink, its very pigmented and I only need to add a dab to get a natural fresh innocent pink flush. Swatched once on the left and blended in on the right. 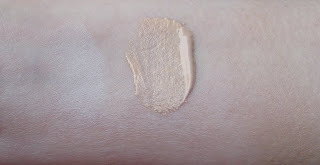 The texture is non greasy and blends with ease, its also extremely long wearing ( I put in on in the morning and after a day of running around after my two year old in humid weather it had remained the same by the time I went to take it off at eight in the evening). It also works well on the lips, giving a delicate pink stain. 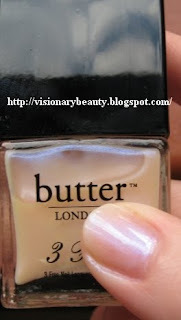 Overall this is an easy to wear foolproof product. I won't pretend to you that I just bought one thing as you know me better than that, so you can expect more EB reviews in the coming weeks. Brushes don’t often excite me, however the more RBR ones I get the more urgency I feel to have the entire range. Ultimately these are different from all the other brushes I have or have owned, whether it is a different shape head or the actual feel of the brush the difference is there. 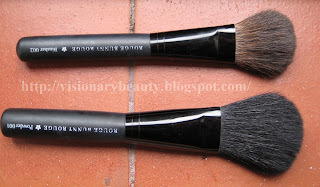 After buying the blush brush I bought the powder and liner brush. 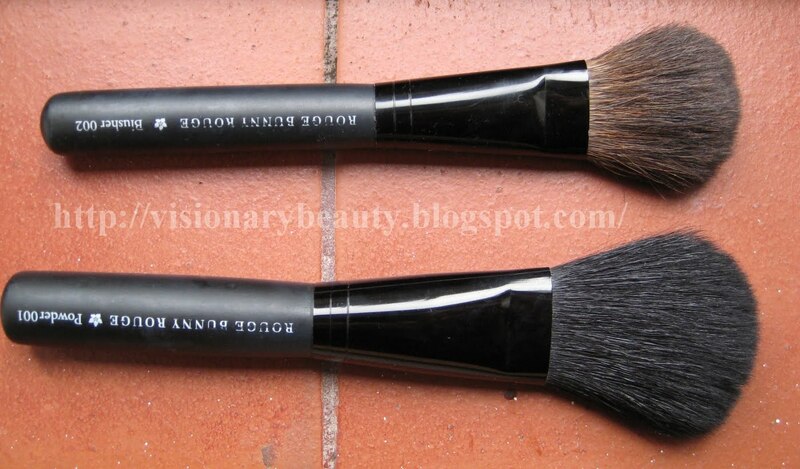 The powder brush 001 (£44) is the largest brush RBR do, its made of natural goat hair. 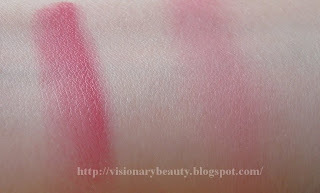 Like the blusher brush it feels very soft, lightweight and delicate. I was surprised by just how flat this was compared to the usual full rounded shape typical of powder brushes. I find the RBR one much more versatile, I can use the tip to apply powder to a more specific area, use it side ways for bronzer and highlighter and use it full on for powder. Where I truly notice a difference in performance was when I went to powder over a break out. If you have dry skin and acne you will know the woes of trying to conceal it, you need it to last all day so powder is a must over the concealer, however putting powder over flaky inflamed skin is never a good thing. I don’t know how but this brush allows me to lay powder down so that it’s fine enough to cover but not to highlight the dry area, almost an invisible finish. The eye liner brush 008 (£22) is not a shape I am use to, I either have slanted ones or the very thin long ones. This is describes as a “conical” shape, although firm it feels very comfortable. Where I find this excels is with cake or gel eyeliners, it applies them a lot more cleanly compared to my other brushes and is great for getting into the little corners if you are tight lining. The brush head is nylon. 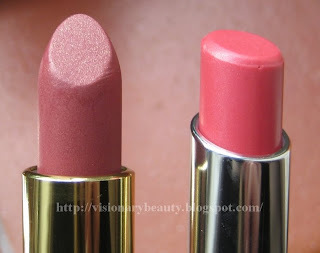 The last part of my Guerlain Summer purchase was the Kiss Kiss Baby in Cherry Summer (£20) there was one other shade, Coral Sunset which was a very sheer peachy Coral. 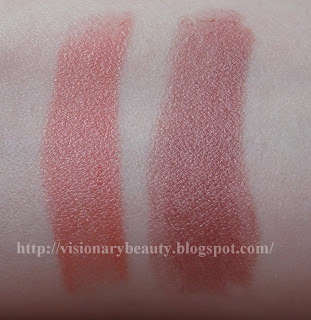 As the Kiss Kiss babies are more like balms rather than lipsticks don’t expect a lot of colour. Cherry Summer gives me a sheer glossy baby pink. It feels quite moisturising on and makes your lips feel soft, it also contains an SPF10. Whist very pretty, I don’t think it’s a particularly unique colour or formula. I also picked up one of the repromotes with the collection,Kiss Kiss lipstick in 557 flushy beige (£20). I don't see any beige in this but I do get a soft berry red with golden shimmer. Overall I did buy a lot of the summer Perles collection and out of everything the eye shadows are the stand outs for me. 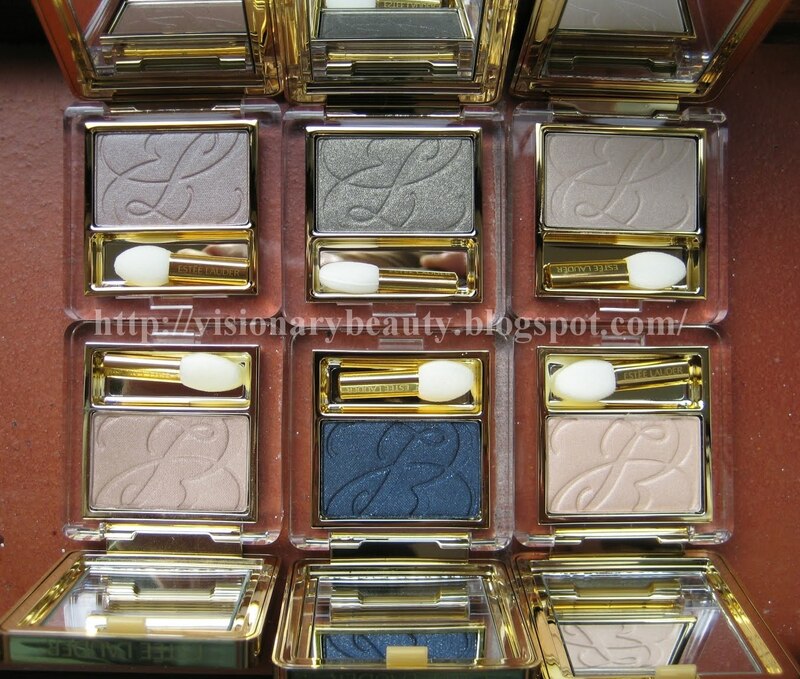 I'm already looking forward to the fall collection, see great swatches by Karla Sugar here http://karlasugar.net/2010/07/guerlain-fall-the-palettes/, I'm really hoping these palettes aren't limited edition as I want 4 of them and at around £51 each that might be a bit tricky! I'd barely touched on the Shu Uemura makeup range, quite a few years back I had a foundation, concealer and two eye shadows but as it was a difficult brand for me to get hold of I moved on. My recent successes with the Shu Uemura Art of hair range pique my interest in the makeup again. 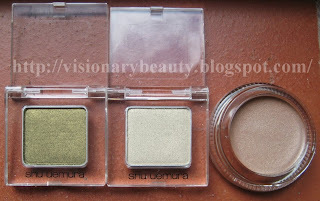 I bought shadows (£14.50 each) in Iridescent Beige 800 and Metallic Green 450. They are not the normal colours I would choose but I thought they would pair nicely together and it was an attempt to veer away from my normal variants of taupe. IR Beige 800 is a golden iridescent shimmer on me rather than beige. ME Green 450 is a vibrant olive green with golden shimmer. The shadows are as soft as I remember them and apply and blend well, I would say that a bit of the colours vibrancy is lost at the end of the day. 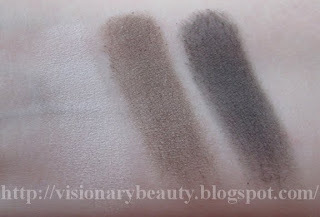 I also bought a cream shadow (£18) in the shade P-Brown. This is slightly shimmered beige brown with a touch of warmth. The consistency is quite lightweight compared to other brands, I don’t get any creasing when used over a primer and powder shadow applies with ease over it (I find with a lot of other brands cream shadows if I go to apply a powder it just won’t blend in). I bought these items from Beauty Expert. 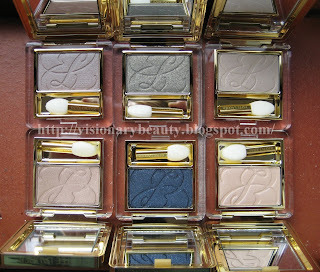 I had all but decided to give up on Estee Lauder as its not a brand I’ve had much luck with, I went innocently into Boots to get my lunch and somehow ended up near the makeup counters, I noticed Lauder had a display out of new Pure Color Eye shadows created by the new creative director Tom Pecheux. 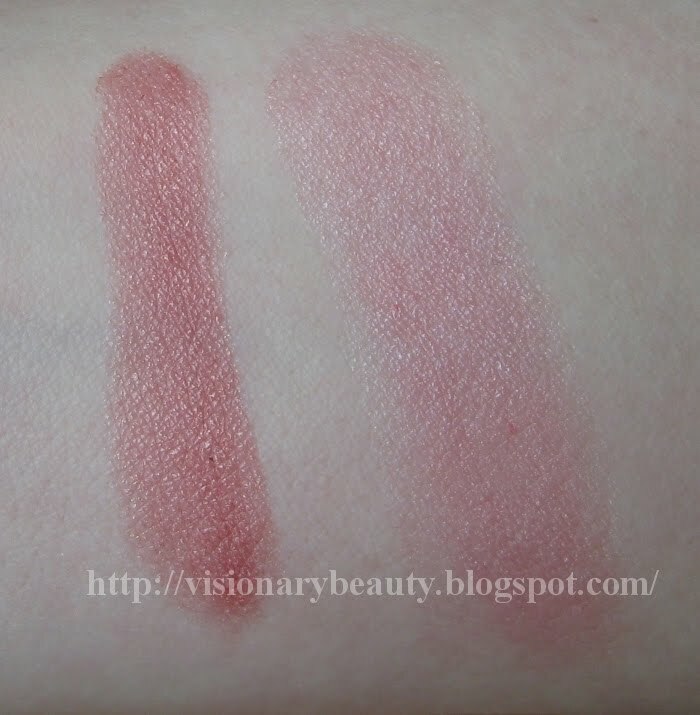 On swatching I was immediately surprised and impressed by the buttery smoothness. 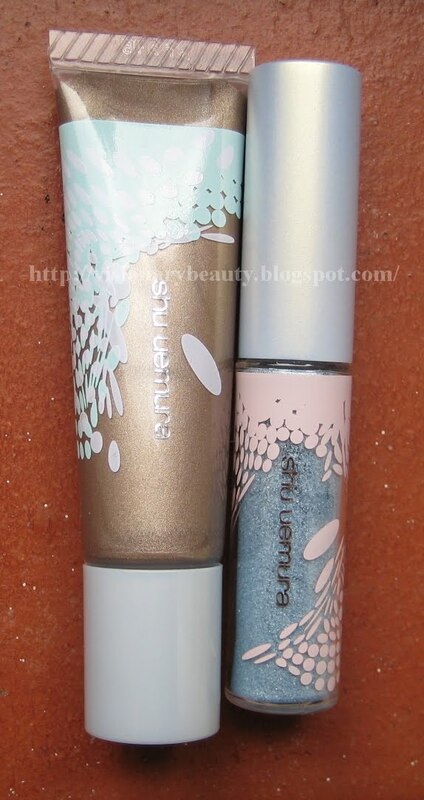 The colour palette is mostly neutral with a few more colourful shades (Greens, Berries); the shadows come in Matte, Satin, Shimmer and Metallic finishes, of these I would say the Metallic are not as smooth and I think work better as liners. I bought 6 shadows, £15 each (I don’t do things by halves) my justification was that Boots currently have a 750 points offer on if you buy 3 premium brand products. Although Tempting Mocha and Enchanted Forest are my favourites, I really like all the shadows; they are extremely easy to build and the colours I bought work well together whichever ones I select. This has definitely changed my mind about Estee Lauder and I’ll be interested to see what else they bring out under Tom Pecheux. After my DiorShow Extase fail I bought MAC Opulash and L’oreal Volume Million Lashes. L’oreal Volume Million Lashes seems to be a UK exclusive for now (I’m not sure why the UK market would need this over other countries). 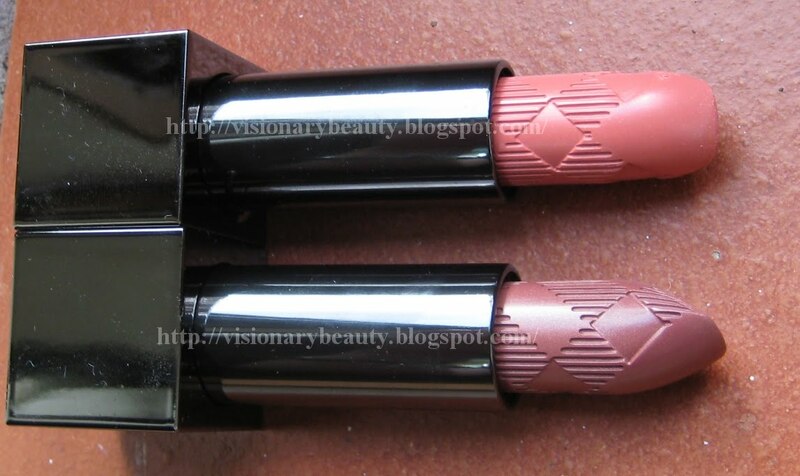 It has a wiper within the tube that aims to remove excess mascara so you get no overload or clumps. It’s meant to separate lashes for a fanned-out lash effect and give maxed up volume. Are you seeing it? My thoughts, it does give some length, it doesn’t really curl, it does clump if you apply two or more layers and makes my lashes look messy. Moving onto MAC's new Opulash, the brush head is very big, in fact I think it difficult to use because of this. It gives me length and lift and the overall effect is quite nice however this is far from the dramatic “biggest, baddest, bouffant lashes EVER” as claimed. I would have said this would be a good everyday mascara but the longer I have had it the dryer the formula has become, its at the point now where it applies flaky, so for me I only got 3 weeks good use from it. So onward we go, I’ve since bought the new Guerlain one which I’ll be reviewing shortly…..